Protect your indoor air quality with expert acoustic ceiling removal in Canoga Park CA. Do you hate the look of lumpy, bumpy textured ceilings or crumbly old ceiling panels? You are right to despise these materials. If these materials date to the 1970s or earlier, it’s possible they may contain asbestos. To eliminate the danger posed by an asbestos ceiling, all you have to do is call AQHI Inc. We will complete a fast and thorough acoustic ceiling removal in Canoga Park CA for you. 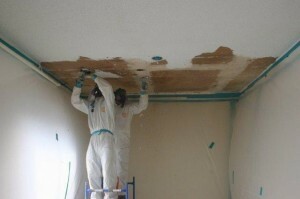 By removing the source of the asbestos contamination, acoustic ceiling removal in Canoga Park CA can obviously help make your property safer. However, it is important that the removal be done correctly, by a qualified contractor, in order to reap any safety benefits. All too often, inexperienced individuals actually make contamination worse by using improper asbestos removal methods that generate lots of dust, or by failing to properly clean the area after work is complete. AQHI Inc. has the skills and the experience required for a safe and successful acoustic ceiling removal in Canoga Park CA, and we have the certifications and the long list of satisfied clients to prove it. We carry full coverage insurance and we promise to leave your property clean after work. Our asbestos removal office for Acoustic Ceiling Removal in Canoga Park CA is open Monday through Friday between 8:00 AM and 5:00 PM and closed for lunch from noon to 1:00 PM. With advance notice, projects can be scheduled for weekends, early mornings and evenings.